Cricket and music haven’t had the best of relationships over the years. The centre of this somewhat unusual Venn Diagram consists largely of ill-advised attempts to fuse reggae and cricket, culminating in Sky Sports’s horrendous operatic cover of 10cc’s Dreadlock Holiday. In fact, the most common favourite cricket song seems to be Booker T and the MGs’ Soul Limbo, an upbeat instrumental piece only associated with the sport because the BBC adopted it as their cricketing theme tune. Bearing this in mind, it was with some apprehension that I reacted to the news that Neil Hannon of The Divine Comedy and Thomas Walsh of Pugwash had recorded an entire album of cricket songs, due for release in early July. While both are undoubtedly talented musicians, it’s an excruciatingly difficult project to pull off. So, do they manage it? Well, sometimes. 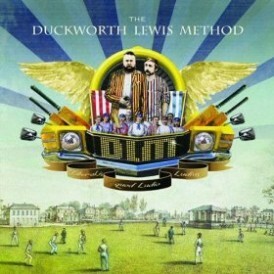 The Duckworth Lewis Method, as the duo have called themselves, have kept their proverbial tongue firmly in cheek throughout. In true Divine Comedy fashion, they avoid outright attempts to be funny for the most part in favour of simply not taking themselves seriously. The result is an album that will have any cricket fan chuckling quietly to themselves throughout. The stand-out track is, without a doubt, Jiggery Pokery– a ballad sung from the perspective of Mike Gatting as he is bowled by Shane Warne at Old Trafford in 1993. ‘How such a ball could be bowled I don’t know, but if you ask me / If it had been a cheese roll it would never have got past me…’ he laments, in the catchiest tune on the album. There are plenty of other highlights, including Age of Revolution, featuring a brass riff that will run through your head for weeks, and Rain Stops Play, an instrumental mid-album interlude as unexpected as it is delightful. On the other hand, the Duckworth Lewis Method have not managed to completely avoid the cringeworthy moments so typical of music written about sport. The Nightwatchman, while a fun concept, falls flat both musically and lyrically, while The Sweet Spot sticks out like a sore thumb with a jarring, repetitive rhythm. The novelty of the album doesn’t always quite make up for some unimaginative melodies, and when the band aren’t on form lyrically the whole experience can grow rather dull. It is an amusing parody, however, with Hannon and Walsh also offering their own unique takes on the match-fixing scandals of the nineties and class divisions in English cricket in the early twentieth century. It’s unfortunate that it doesn’t maintain the quality present in parts consistently enough to be an especially listenable album, but perhaps I should not be so critical. This is an album written by cricket fans specifically for cricket fans, and they at least should find it pretty entertaining. I certainly did. But I do wonder what the music websites will make of it. Heard them on Radio 5 earlier today and enjoyed the couple of tracks they played. Unlikely to listen to a whole album though. I’m a big Divine Comedy fan, so I will like it I suspect. Had a look for it today, but didn’t expect to see it in Tesco’s tbh. Might need a trip into town. Although the lyrics are witty, especially on ‘Jiggery Pokery’,they are a lot funnier when seen with the accompanying videos. They can be found on the Timesonline website. Just follow the Duckworth Lewis Method link. Have the album, and its very enjoyable. One of those where the tunes stick in your head.